What a fantastic topic this week: Income and Wealth Inequality. I don’t think I ever go a week without seeing an infographic online that shows data on wealth or income inequality, some sort of scale or graph to illustrate the differences, and a quote from Bill Gates or Warren Buffet on why taxes should be raised on the rich. #FeeltheBern. Since Crash Course did a pretty great job talking about productivity, capital, and technology in Episode #6, I was hoping that they would revisit these topics in explaining what wealth is and how people (rich and poor alike) become wealthier without doing much work. They more or less covered this topic before: greater capital accumulation allows businesses to take risks by investing in research for technological upgrades. These upgrades make goods cheaper and more accessible to consumers. Crash Course started off great by distinguishing between wealth and income: wealth is current assets, and income is the new wealth that is flowing in. 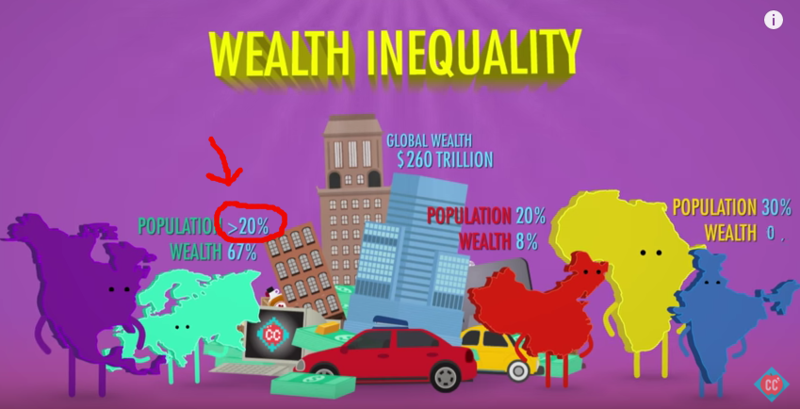 They accurately show the difference in wealth between continents (and major countries like China), and then followed with a video graphic showing the differences in income quintiles throughout the world. Crash Course never really makes a major point with this. It seemed a bit rushed (they have to keep every episode around 10 minutes, after all), but I wish they had discussed how income taxes only affect new money coming in and not old money already earned. In other words, when Warren Buffet or Bill Gates argues to increase the income tax, they are not advocating for taxes that would affect their wealth, but rather the income of others. Most economists agree that globalization has helped the world’s poorest people, but it’s also helped the rich a lot more. Harvard economist Richard Freeman noted, “The triumph of globalization and market capitalism has improved living standards for billions while concentrating billions among the few. Last week Crash Course talked about how Globalization significantly helps the poor and is the greatest contributor to ending extreme poverty. This week however, helping hundreds of millions of people out of extreme poverty pales in comparison to how much richer the rich are becoming. It was very surprising to see two very different emphases on globalization in consecutive weeks on Crash Course. It is no doubt accurate to point out that globalization creates greater income inequality (just as the Industrial Revolution did, as they note), but it’s not necessary to put this fact in such a dark light. Crash Course here is supposed to be talking about the causes of income inequality, not editorializing it as good or bad. This comes later in the episode (and in this blog post). Economists point to something called “skill-biased technological change.” The jobs created in modernized economies are more technology-based, generally requiring new skills. Workers that have the education and skills to do those jobs thrive, while others are left behind. So, in a way, technology’s become a complement for skilled workers but a replacement for many unskilled workers. 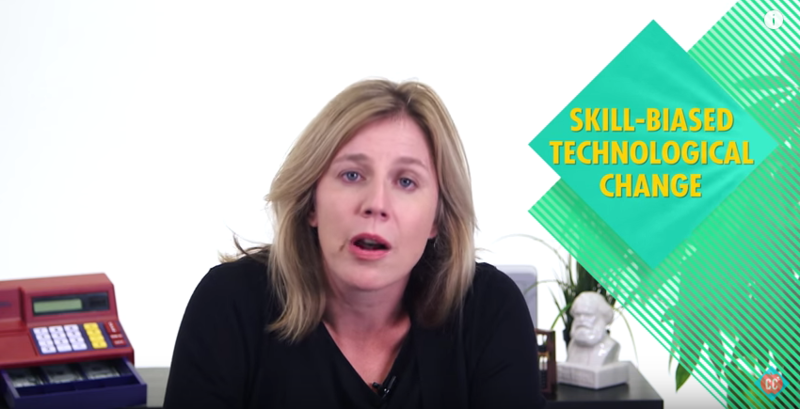 Crash Course does a great job at explaining how technology affects the job market. Technology raises the salaries of skilled workers, as one person can create more revenue (or work product) for his/her business. Meanwhile, the technology puts unskilled workers out of their current job. This widens the difference in income between skilled and unskilled workers. But this is not the same as saying that unskilled workers have no jobs now because of technology has made them obsolete. On the contrary, technology has made thousands of unskilled jobs available (Taskrabbit) in addition to millions of low-skill jobs (Uber, Airbnb hosting). As we’ve mentioned before on this blog, technological developments create shifts in the economy, moving people from certain areas of the economy to others. In economic theory however, it is possible that one day, technology will reach a point where all desired tasks under a certain value will be performed by technology. But in an economy where you can still get paid to stand in line, there are an unlimited amount of unskilled or low-skilled jobs. The end result is an ever widening gap between not just the poor and the rich, but also the poor and the working class. As economies develop and as manufacturing jobs move overseas, low skill low pay and high skill high pay work are the only jobs left. People with few skills fall behind in terms of income. People with certain skills are put out of work by technology. This phenomenon has been happening for centuries, but especially after the industrial revolution. Technology has always been putting people out of work, just ask the horse and carriage industry. Is today any different from other times in history? As stated above, one way it is different is that technology is also creating millions of low-skilled jobs. There’s still a lot to say about this episode, and a lot of questions still to answer. For example, what should be done (if anything) about income inequality? Stay tuned later this week (possibly Friday) for the second part of this post. Don’t forget to join our newsletter and our facebook group ! Previous Previous post: The Crash Course Criticism Facebook Group!